I am a chap who has worn a moustache for most of his life, but one thing I’ve never tried is the full ‘ironic French’. On a recent trip to Brighton I was struck by the dense forests of facial hair sprouting unchecked from the faces of hipsters on every street-corner. It seems as though the much-predicted ‘peak beard‘ is some way off. The idea formed in my mind that I could one day take advantage of one of the few skills I can confidently demonstrate in public – that of growing a moustache. 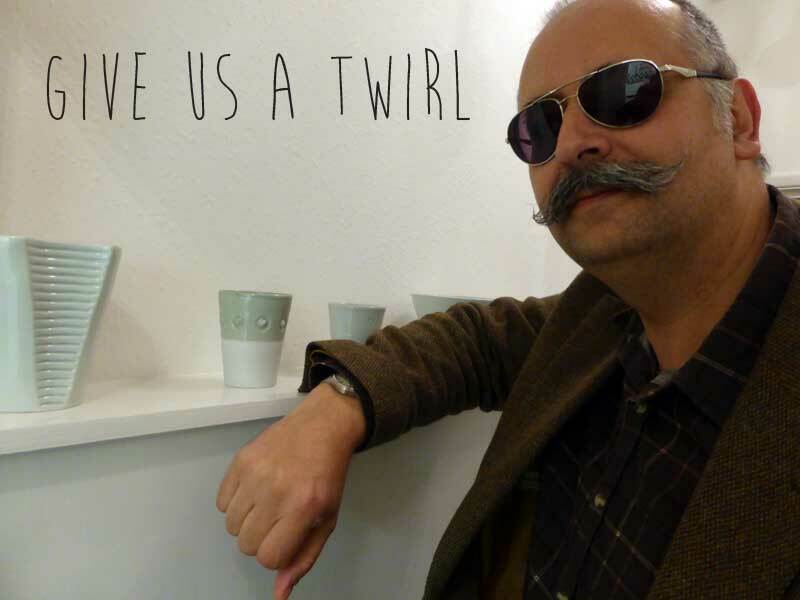 The ladies of Wight Catwalk have many skills, but one thing they probably can’t do is to grow a moustache big enough to twirl in the style of Terry-Thomas’s archetypal villain Sir Percy Ware-Armitage. So when Wight Catwalk challenged me to demonstrate my claimed prowess in this matter, I was of course more than happy to oblige. A key element in moustache maintenance is wax. And there is an absolute cornucopia of different moustache wax types to try. I hit upon the popular Scoundrel’s Wax, and ordered a 15ml pot of their bergamot and sandalwood scented moustache wax for £4.99. With the addition of a little moustache comb that I had in a drawer somewhere for just such an eventuality, I was ready to proceed. If you’re looking for a moustache-waxing tutorial, look elsewhere. The internet is full of them. But I might pass on a few tips. One is to have a bit of patience. You need a long enough moustache to wax, and it will take while to get there. In the meantime, you’ll endure the infamous ‘soup-strainer’. During that period, gentlemen, I suggest you avoid cappuccino and spaghetti bolognaise. If there’s enough demand, I might impart more of these hints – but these helpful step-by-step illustrations may prove equally enlightening. 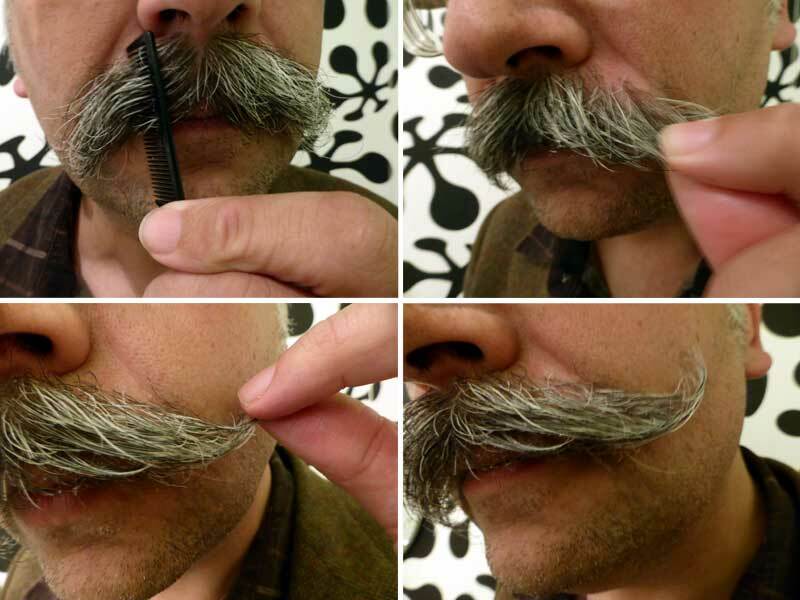 How to wax your moustache. Scoundrel’s Wax turned out to be first-class stuff. Firstly, anything you stick under your nose all day has to be pleasant to the nostrils without doing olfactory violence. This stuff hit the mark. Secondly, as a natural beeswax product, it was easy to manipulate and could soften between the fingers very rapidly – but at the same time a single application would hold all day. After about a month my 15ml tin was much depleted. I resolved to buy a bigger one, but was curious about the many other types of wax available. Wight Catwalk’s Cat found another candidate for me to try: Uppercut Deluxe Mo Wax, available from Asos. This was £8.99 for 25g – so quite a lot more. It was described as ‘strong hold wax’ which I thought I might need, as the success of the Scoundrel’s Wax was allowing my moustache to reach unanticipated breadth. Sadly, the Asos Uppercut didn’t uphold my bristles for long. This wax was made from paraffin wax as opposed to beeswax, and the difference was immediately apparent to the touch. The wax was greasy, like candlewax, and took a lot more manipulation to reach a workable consistency. What’s more, once it was worked in – which took some time – the benefits were short-lived. The pot was bigger, but it took two applications a day to achieve the same result as a single dash of the Scoundrel. I also discovered the dangers of excessive waxing. If you apply too much, you either get the dreaded moustache-dandruff; or the whole thing goes floppy and greasy. Both require a trip to the shower for a complete restart. So my conclusions, waxers. 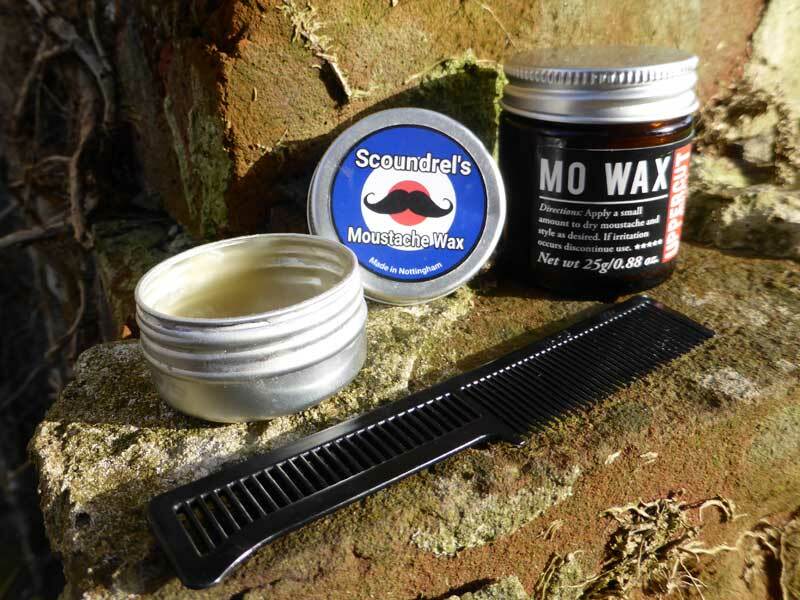 Scoundrel’s Wax proved excellent for my purposes, and I would definitely recommend a natural beeswax moustache wax over a paraffin-based alternative. I shan’t be bothering Asos again but next time I go for the full-blown ‘First World War Ace’ I shall invest in a couple of tins of Scoundrel’s ‘extra firm hold moustache wax‘. Then I might find out just how far I can go to achieve the max wax.